Anthropologie: Anthropologie is making a donation to the National YoungArts Foundation in the U.S. and the National Arts Centre in Canada. The National YoungArts Foundation identifies and nurtures accomplished young artists in the visual, literary, design and performing arts, and assists them at critical junctures in their educational and professional development. The National Arts Centre collaborates with artists and art organizations across Canada to create a national stage for the performing arts, and acts as a catalyst for performance, creation and learning across the country. On December 1st, Anthropologie is hosting styling events in over 80 stores in the U.S. and Canada. Be sure to use #AnthroHolidays on December 1st if you attend a styling event and throughout the holidays to show your support. Free People: 20% of proceeds on select items on FP.com and in all U.S. and Canada Free People stores will go to Girls Inc., a nonprofit organization that offers programs for girls ages 6-18 to empower them on their road to success and encourage girls to be strong, smart, and bold. On an ongoing basis, Free People is giving back to Girls Inc. through social by featuring inspired women in the global female community – each #FPGirls post contributes a donation to Girls Inc. and shoppers who skip or reuse their Free People shopping bag in stores also results in a donation to Girls Inc.
Urban Outfitters: is donating 100% of the profit from the sales of an exclusive collection of apparel and accessories to GLSEN, which is the Gay, Lesbian & Straight Education Network. It’s a nonprofit that’s working to affect positive change for LGBTQ children in schools to ensure they are valued and respected regardless of sexual orientation, gender identity or gender expression. 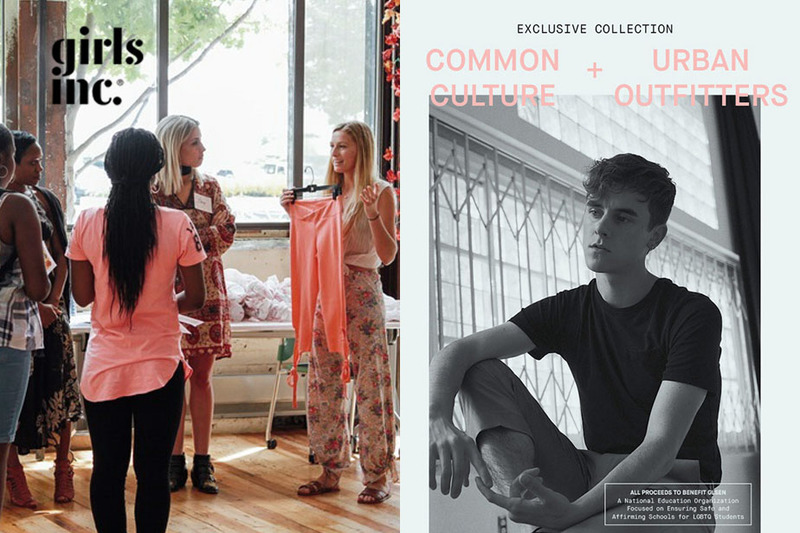 UO is partnering with YouTuber and entrepreneur, Connor Franta, in a collaboration with his brand, Common Culture, on exclusive apparel and accessories that will be available in select stores and online. Starting on Giving Tuesday, Connor will kick off a mini store tour starting at Space 15 Twenty in Los Angeles, where 200 lucky fans who purchased Common Culture gear will get to meet Connor and get a signed copy of a CD compilation from his record label, Heard Well. Connor was recently honored with the Game Changer Award at the GLSEN Respect Awards Gala. Don’t forget to use the hashtag #GivingTuesday and visit www.givingtuesday.org to learn more about how you can make a difference.